Pre-wired LED light strings. Not separate bulbs and cords. 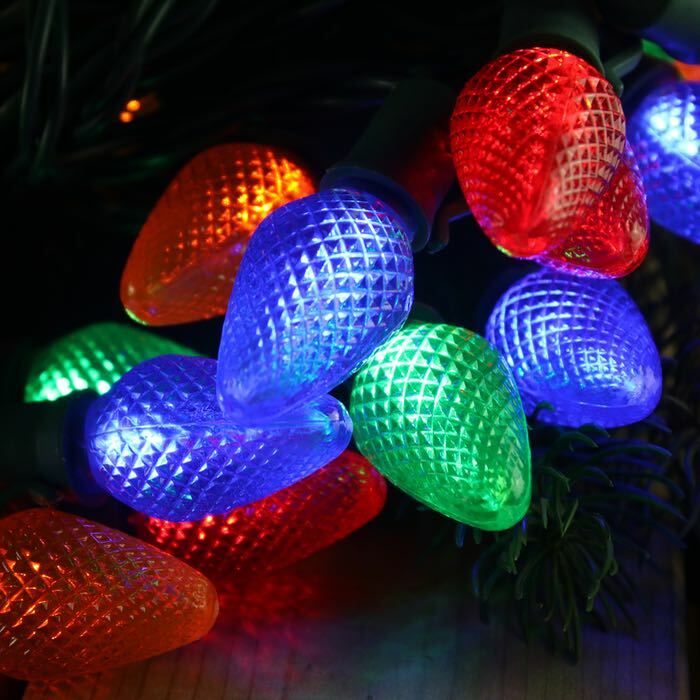 Liven up this holiday season with C7 Multi color LED lights! These C7 multi color LED Christmas lights come just under 16 feet of lit length and are approximately 16.6 feet long. With 25 lights to the string and 8 inch spacing, these lights can be used inside and outside for a wonderful setting! 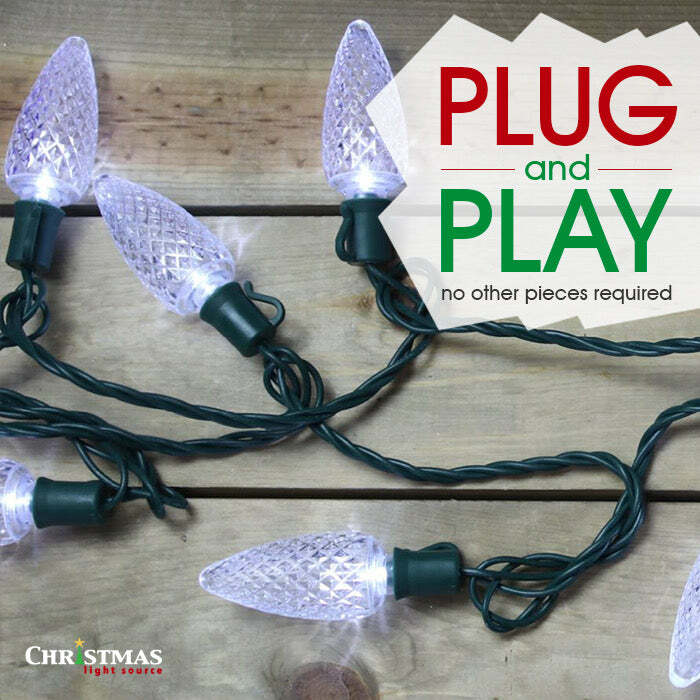 You can plug 87 sets of these lights end to end before having to use a second extension cord. That gives you a lot of coverage. Our customers use these lights in both traditional and non-traditional uses. These LED Christmas lights aren't just for Christmas anymore. Plug all of our products into outdoor rated surge protectors. Virtually unbreakable, colors will not fade or peel. Bulbs use up to 98% less electricity while remaining cool to the touch. 2 Fuses. Can I mix LED light strings? What car headlights can tell us about LED Christmas Lights? What should I use to outline the border of my yard and trees? Q: How many diodes in a c7 bulb? A: Each "bulb" has a single LED that matches the color of the lens. A: These are steady-on, one single color per bulbs. They are not color changing. Thanks for your question, hope that helps. Q: HOW MANY CAN YOU STRING TOGETHER? A: Good grief! Thanks for your question because it looks like the specifications on this product have somehow disappeared!! we've added all the specifications. You can run 87 sets in series. Q: Are these bulbs replaceable? If one goes out will the others stay lit? A: These bulbs are actually not replaceable to increase their resistance to moisture and the elements. If an LED goes out, it will not affect the operation of the other lights unless the socket is damaged. Keep in mind that surges on the power input is the number one enemy of LED lights so we strongly suggest that folks plug their light strings and bulbs into an outdoor rated surge protector. I'm sorry we don't carry those but you can find them locally at Home Depot or Lowes.